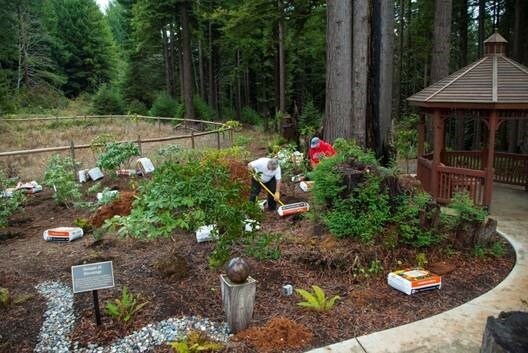 The Eureka Chapter of the American Rhododendron Society has generously chosen to complete a huge landscaping project to benefit Hospice of Humboldt. The plan is to complete the planting in phases over the next three years. At the beginning of December, the first phase of the extensive project was completed with plantings outside the patient rooms at the Ida Emmerson Hospice House. The California Conservation Corps also assisted with the project by providing personnel to help with labor and landscaping. Hospice of Humboldt has been serving families locally for 40 years, has a staff of over 100 employees and is privileged to work with 124 volunteers. Hospice provided end of life care to 550 patients last year. The person-centered care Hospice provides allows patients comfort and dignity and gives families support at a time when they need it most. For more information on Hospice of Humboldt services, call (707)445-8443, visit www.hospiceofhumboldt.org or follow us on Facebook. Every Tuesday evening the Humboldt Cider Company offers 10% of all tap sales to a non-profit. Past beneficiaries included victims of the Camp Fire and the Humboldt Vet Tech Association. Find more information here. 64. GETTING BUTTS OFF THE BLOCKS. Fhyre Phoenix writes: "Three winters back, the sight of people sleeping in doorways and on concrete in the rain and cold in Arcata broke my heart. So I made a comfy bed in the back of my pick-up truck (which had a cap over it) and parked on a level, public, parking spot under a streetlight. I walked downtown Arcata and offered a place to sleep (in the back of the truck) to any individual who seemed to really need it. That first guest worked out well, so I kept on offering the bed to others. Some people stayed more than one night. In the end, I provided a total of 47 nights' shelter to a total of 15 individuals. Cost: $0. and it grew my senses of compassion and generosity. It was humbling and I am grateful." Byrd Lochtie writes: "Each year when applications come to HAF for a grant from the Robert M. Lochtie Fund, I read and summarize all the applications and then email them out to my children and grandchildren (and spouses) Every member of the family chooses their favorite three applications, and then we fund as many as we can with our limited (between $1800 and $3000) funds. I try to fund at least one of each person’s three choices. We started this process when my youngest grandchild was in the 3rd grade. This was my way of helping my family––all ages––learn about philanthropy and how to help other people who may not have as much as we do. The youngest grandchild is now 23 and everyone looks forward to getting the list each November." Katie Darden writes: On November 8, 2018, three different households in our extended family lost everything in the Paradise fire. For my grandson, who grew up in Paradise, and is currently attending College of the Redwoods, it was devastating. His other grandmother is disability retired. His aunt, her husband and 4 kids were very active in local sports. His fiance's stepdad and brother also lived in Paradise. Luckily all 3 families escaped with their pets, but not much else. We set up online fundraisers for the 3 families. I am also donating all November and December proceeds from my adult coloring books on Amazon and Etsy to the families. Through the generous donations and purchases from others, so far we have raised about $3500. Considering how many people were affected within the community, we feel blessed. Another family member was able to donate a travel trailer so the family with 4 kids has their own place now. Brian Sturdivant, founder of Hip Hop For Hope Children's Cancer Foundation, tell us the foundation was able to buy $1200 in toys for local youth this year via an online fundraiser. Normally the group puts on a show but couldn’t this year due to some family hardship. This was the group’s 8th year of fundraising for Toys For Tots. The Foundation, which is a DreamMaker project of Ink People Center for the Arts also provides offers small travel grants to families with children diagnosed with cancer, to provide travel funds for food, gas and lodging while receiving cancer treatment at facilities outside the county. Read more at www.hiphop4hope.net. Don't like Christmas music? A good horn section might change your mind. The CD release party raised $1600 and a car-full of clothing, bedding and toiletry items for the Betty Kwan Chinn Homeless Foundation. Artists and art lovers gathered at the Morris Graves Museum of Art on Friday, Dec. 14 to celebrate the birthday of Victor Thomas Jacoby who, before his death in 1998, created an award to support artists in our community. The award, now in its 20th year, is maintained by the Humboldt Area Foundation and awarded annually to artists and craftspeople in support of new techniques and ideas. In accordance with Victor's wishes, every few years the award is open only to tapestry artists. This year's winners were April Sproule, Sandra Kernen and Nancy Kennedy. They joined 20 years' worth of winners for a retrospective exhibit on display through Jan. 27. Volunteers with Humboldt Grange #501 and the Eureka Host Lions Club hosted four classes of kindergarten and first graders from Pine Hill Elementary on Thursday, Dec. 13. The kids got to meet with Santa and volunteer "elves" helped kids pick out and wrap gifts for their families. 37. "GIVING THE GIFT OF GIVING"
Dream Quest Willow Creek Youth Partnership mailed invitations to the Annual Gift of Giving event along with $20 gift certificates to 180 youth ages 4-16 years old. Fifty-eight Willow Creek area youth and their families attended the event. Sixteen adult volunteers joined the Dream Quest staff who, along with funds from HAF's Holiday Funding Partnership, made it possible for these youth to experience the joy of giving by gathering gifts for their families. Funds were used to mail the invitations on nice holiday stationary, to purchase wrapping supplies for several hundred gifts, a few treats to add to the reception and to supplement staffing cost. This year each youth also received a wrapped gift from Dream Quest that was donated by a community member. 31. WILD RIVERS COMMUNITY FOUNDATION GIVES OUT $24,000 IN HOLIDAY GRANTS. 29. HAF FUNDS YOUTH OPIATE PREVENTION PROJECT. The Humboldt Area Foundation has approved a grant of $9,950.00 to the Humboldt Department of Health and Human Services- Maternal, Child, and Adolescent Health from the Schulze-Kronenberg Memorial Fund, a fund of the Foundation, for its Youth Opioid Use Prevention Project. The 20th Annual Humboldt Library Foundation Gala raised roughly $70,000 to support local libraries on Monday Dec. 10. Senator Mike McGuire acted as auctioneer in the live auction, and many local businesses donated merchandise and services to support the library. Ronda Wittenburg was the recipient of the 2018 Helen Everett Award after 47 years of service to the library. Toys for Tots is a U.S. Marine program which collects and distributes new, unwrapped toys to children every holiday season. Youth Engaged in Philanthropy (YEP) hosted an award ceremony on Tuesday, Dec. 4 to give out $6,000 in awards to groups in the Eel River Valley working on environmental issues. YEP members are students from Fortuna Union High School, East High School, and Academy of the Redwoods who are interested in bringing positive change to our community through the power of grantmaking. This years' grants included $5,000 to River Life Foundation and $1,000 to ASK ME: The Ecology & Art Education Program fiscally sponsored by the Ink People. 24. GRACE MARTON MEMORIAL FUND BRINGS EXTRA JOY TO EUREKANS. Humboldt Area Foundation's Donor Engagement team was able to bring some good news to the City of Eureka recently, with news that the Grace Marton Memorial Fund would be used to build and maintain a multi-use playground at Halvorsen Park, near the waterfront. Marton, who passed in 2016, was a green thumb and animal lover who enjoyed spending time in Humboldt's wild places with her partner Lance Hardie. 22. CALIFORNIA TRIBAL TANF PARTNERSHIP PUTS TOGETHER FOOD BOXES. With the help of funding from the Holiday Funding Partnership, the California Tribal TANF (Temporary Assistance for Needy Families) put together food boxes for more than 75 Native American familes. With thanks to the hard work of the women in this picture: Stacia Parks, Emmilee Risling, Roxanne Andrade, Linda Gillette, Cindy Green and Celeste Ruiz. More about Holiday Funding Partnership grants here. 21. STATE SENATOR MIKE MCGUIRE RALLIES HIGHSCHOOL STUDENTS TO COMPETE IN FOOD DRIVE. 20. BETTY CHINN'S WORK CONTINUES THROUGH THE COLDEST MONTHS OF THE YEAR. The Betty Kwan Chinn Foundation is preparing to distribute winter emergency food bags beginning Dec. 10. Bags will be distributed Mondays, Wednesdays and Fridays, 9-11 a.m. at 35 W. Clark Street. To give to the Betty Kwan Chinn Homeless Foundation Fund, click here. 17. COMMUNITY DONATIONS ARE PAVING THE WAY FOR BAY TRAIL. Rotary Club of Arcata Sunrise presented a $1,000 check to the Humboldt Bay Trail Fund on Wednesday, Dec. 5. (From left to right, Rees Hughes, Ray Noggle, Aaron Gottschalk, Dennis Rael, Amber Madrone). The check was presented at Wildberries Marketplace, which matched $23,917.42 in customer donations in October and November! To learn more about the trail and to donate click here. 15. OUR FAVORITE FOOD IS PIZZA TOO. 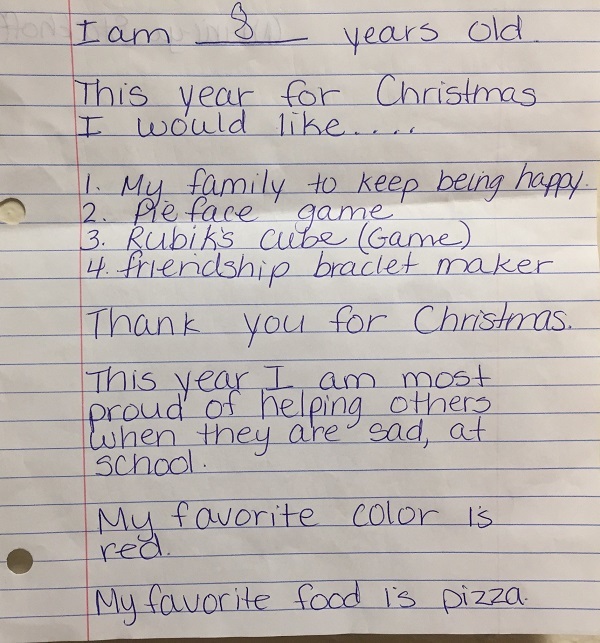 CASA of Humboldt is posting its clients' holiday wish lists on Facebook and we are 100% behind this 8-year-old who wants a happy family and to keep helping other kids at school. CASA helps advocate for children in foster care. To see more lists and find out how you can help CASA kids, check out their Facebook page here or go to www.humboldtcasa.org. 10. A EUREKA POLICE SERGEANT RESPONDS TO THE SOUNDS OF SCREAMING. From Tri-County Independent Living: Last year, Tri-County Independent Living launched its Residential Ramp Loan Program. To expand this program, TCIL applied for and received a generous grant from Humboldt Health Foundation (formerly Union Labor Health Foundation). TCIL thanks Humboldt Health Foundation for its generous support of the Residential Ramp Loan Program. The funds have been used to install one modular ramp system and purchase the parts for two more modular ramp systems. This grant will allow TCIL to continue this much needed program and ensure more community members have access to their homes and communities. The goal of the program is to loan ADA compliant aluminum modular ramp systems to low-income community members with mobility difficulties. “The hope is our program will bridge the gap until the consumer can work towards obtaining a ramp of their own, or find accessible housing,” stated Assistive Technology Coordinator Juliannah Harris. The ADA compliant aluminum modular ramp systems that TCIL has installed since the program began has given community members who have them the freedom to go to doctors’ appointments, community events, receive medical care, go shopping, visit family and friends, and so much more. A door that was once closed for these individuals is now open thanks in great part to Humboldt Health Foundation. TCIL looks forward to serving community members and meeting this unique need in the community. "Great surprise yesterday! We got a call from Fin-N-Feather Pet Shop requesting that we pick up a donation of pet food. Did you know that Food for People offers cat and dog food to families when its available? No one wants a beloved family pet to go hungry when budgets are tight. A very generous anonymous person purchased 256 lbs of high-quality dog & cat food to go to Food for People. Thank you!" -- Via Facebook, reprinted with permission. Interested in helping Food for People? Click here. 4. HUMBOLDT WOMAN DONATES PRIZED POSSESSION TO CAMP FIRE SURVIVORS. “My friend Bell Waters has been working on a nice Airstream unit for many years. She has put all her resources and much love into restoration and artistic embellishment of it. Needless to say a whole ton of love has gone into it. Also she has worked very hard to maintain one truck then another in order to have a way to move it . When she heard of the deadly/ horrific so-called, Camp Fire she selflessly drove to Chico to give her prize possession to some family that needed it more than her. I have tears running down as I write because this act of supreme kindness was all she had. The only reason I even know about this is because she was worried about the dissimilar type of wheels that were on the trailer and she wanted someone to know that she was embarking on a rather dangerous journey from Arcata over to Chico. She gave it to a family with two young teenage daughters whose grandparents and all their entire family also lost all they owned in that tragic firestorm. Of course she has no idea that I am reporting this act of immense from-the-heart caring for fellow human neighbors is above and beyond what ever most of us could ever do. It was all she had. 2. PREPARED FOR EVERYTHING, INCLUDING HUNGER. Every year HAF stocks up on food to keep any guests using the community center safe and comfortable in the case of a natural disaster. We are truly fortunate, as so far we haven't needed it. If you have food set aside for emergencies, consider donating it before it expires and replacing it annually. Pictured: Choice Pantry Coordinator for Food for People Erin Tharp receives a donation from HAF Office/Safety Manager Jill Moore. 1. GUY KULSTAD, STEADFAST VOLUNTEER AND ANONYMOUS HERO.